EMCORE Corporation (NASDAQ:EMKR) has introduced their 5200 Series, 3 and 6.5 GHz Fiber Optic Links for satellite communications and wireless applications. The 5200 series are a compact, weatherproof fiber optic transmitter and receiver pair for Inter-Facility Link (IFL) applications where high-performance under demanding conditions is critical. EMCORE will debut its new 5200 series fiber optic links at Satellite 2017, booth #1736, March 7-9 at the Walter E. Washington Convention Center, Washington, DC. EMCORE’s 5200 series fiber optic IFLs provide highly-linear, low-noise operation and function as transparent RF fiber links. They eliminate the limitations of copper systems by enabling longer transmission distance while retaining the highest level of signal quality. In addition, EMCORE’s IFLs provide several other significant network advantages, including simplified network design, ease of installation, and immunity from EMI/RFI and lightning. 5200 series transmitter and receiver pairs are available in two frequency range models for tailoring to specific customer requirements. 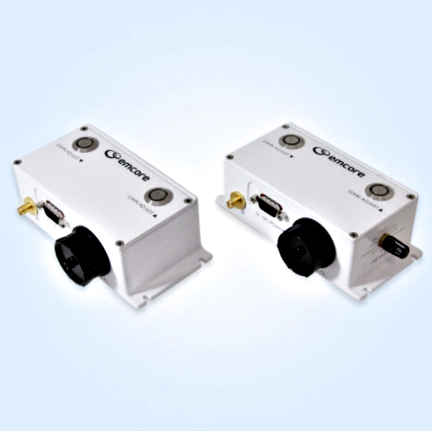 The 5200 3 GHz has frequency response from 20 MHz to 3000 MHz and the 5200 6.5 GHz ranges from 20 MHz to 6500 MHz. The 5200 3 GHz includes 50 ohm SMA and 75 Ohm BNC options with LNB power options of 13 v /18 v / 22 kHz and the 6.5 GHz features 50 ohm SMA. Each model allows for up to four flange-mount modules per 1RU chassis, and both include variable RF gains. In addition to the 5200 series, EMCORE will showcase its complete line of satellite communications RF transport products at Satellite 2017, featuring the modular Optiva platform and the latest release of the EMCOREView Management & Control Suite. EMCOREView features a new graphical user interface that makes remote monitoring and control of Optiva enclosures and modules simple. Through the utilization of Simple Network Management Protocol (SNMP), the Optiva EMCOREView Controller Card (model OPV-CTLR-IC) operates under a uniform software platform which allows for efficient integration with other devices. It collects data coming from any Optiva enclosure and the Optiva EMCOREView software analyzes and displays the data to the user. Dr. Henry Cheung, EMCORE’s Senior Product Director for satellite RF fiber optic transport products, indicated that with bandwidth up to 6.5 GHz and adjustable gain control with high-dynamic-range, the 5200 transmitter and receiver modules are the most versatile microwave link modules in the marketplace. With other optional features that include IP66 weatherproof housing and LNB or GPS voltage output, they support a broad range of applications including Earth stations, TVRO, VSAT and 5G wireless systems.